Genetic engineering is changing the terrain of development studies. Technologies with unprecedented potential - the capacity to move genes across species - have created widely politicized phenomena: ‘Frankenfoods’, ‘GMOs’, and ‘The Terminator’. En masse, the public has reacted with equanimity or appreciation to genetically engineered pharmaceuticals, beginning with insulin, but transgenics in food and agriculture have raised a globally contentious politics. the costs and effectiveness of biosafety protocols. The authors collectively conclude that predictions of disaster for the poor from transgenic technology are uninformed by empirical results, rest on misunderstandings of biotechnology or the poor or both, or get the science wrong. Yet the triumphalism of pro-transgenic forces, however, must be tempered by serious unanswered questions: much is unknown, but the transgenic genie is out of the bottle. 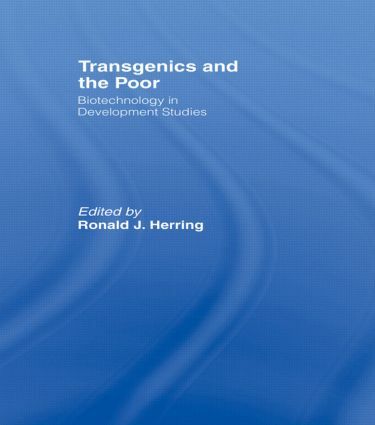 In this much-needed book, an emergent empirical literature allows scholars in disciplines ranging from micro-biology to economics and political science to assess the potential effects of transgenic organisms on poverty through multiple dynamics of property, yields, prices, biodiversity, environmental integrity and nutrition. Ronald Herring is Professor of Political Economy in the Department of Government at Cornell University, where he has been Director of the Mario Einaudi Center for International Studies, the John S. Knight Professor of International Relations, Chair of the Department of Government and Acting Director of Cornell’s South Asia Program. Before Cornell, he was Professor of political science at Northwestern University and taught briefly at the Universities of Chicago, Texas, Washington, and Wisconsin. Herring has been Editor of Comparative Political Studies, and remains on its editorial board, as on the boards of Contemporary South Asia, Critical Asian Studies, Journal of Development Studies and India Review. His earliest academic interests were with land relations; Land to the Tiller: The Political Economy of Agrarian Reform in South Asia (Yale University Press/Oxford University Press) won the Edgar Graham Prize (London l986). He has recently explored connections between economic development and ethnicity -- Carrots, Sticks and Ethnic Conflict: Rethinking Development Assistance (University of Michigan Press, edited with Milton Esman). Herring is currently Director/Convener of the Program on Development, Governance and Nature at Cornell University.